My favourite time of year is here again and, as always seems to happen, my crafting attentions turn to yarn. Well, it’s just so cosy isn’t it? 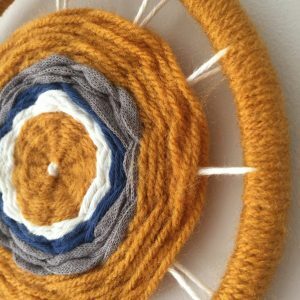 I’ve gone a bit mad pinning yarn-based crafts. Who knew you could make pom poms that look like animals? Eleanor is very impressed! I decided to actually have a go at some weaving last week after being inspired by a tutorial I’d pinned. 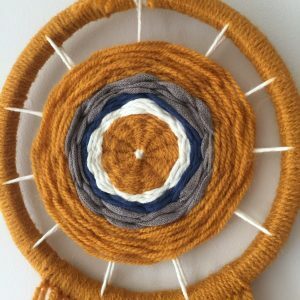 You can definitely buy circular looms for weaving, but I used an embroidery hoop. The tutorial I came across gave instructions for setting up the warp threads and from there I just winged it! As our living room is mustard and grey, I used those colours as well as white and a little bit of navy blue. I think these colours look great together. 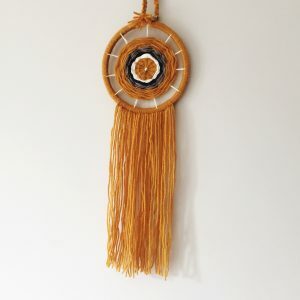 The weaving itself was simple and very relaxing, I really enjoyed it so this isn’t the last wall hanging I’ll be making. I don’t know enough about weaving to know if the way I’ve done this is “right”, but I do know that I’m very happy with the end result! As you can see, I didn’t weave all the way to the edge of the hoop, I quite liked the look of having the warp thread showing a little. Once I’d finished the middle part, I wanted to add some long fringing underneath. I just looped the yarn all along the bottom. 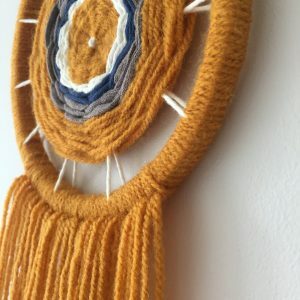 After that I wrapped the mustard yarn all around the hoop to hide it; I think it finishes it off really well.